UPDATE: While Sen. Menendez’s case has ended in a mistrial, Senate Majority Leader Mitch McConnell is calling for an ethics probe against the New Jersey Democrat. McConnell also called for a probe against Sen. Al Franken (D-MN), who was caught in a photograph groping radio host LeeAnn Tweeden back in 2006. Both were on a USO tour in the Middle East. BREAKING: Senate GOP leader calls for ethics probe of Democratic Sen. Bob Menendez, whose federal bribery trial ends in mistrial. BREAKING: Senate Ethics Committee says it intends to resume its preliminary inquiry into Democratic Sen. Bob Menendez. Sen. Bob Menendez (D-NJ) might have looked like a dead man walking. The federal judge presiding over the case, William Walls, decided not to toss any of the 18 corruption charges brought against him prior to jury deliberation. Menendez was not allowed a special timeframe from the trial to vote in the Senate, with the judge declaring that his job was not different than that of a cab driver. It seemed like a clear-cut case. Sen. Menendez using his office to help his friend, Florida-based ophthalmologist Salomon Melgen, who would then offer lavish gifts and $700,000 in campaign contributions to the New Jersey Democrat. Alas, trouble began last week when a juror, who was told she could be excused due to a pre-planned vacation, said this case was going to end in a hung jury. There was no consensus on any of the charges. 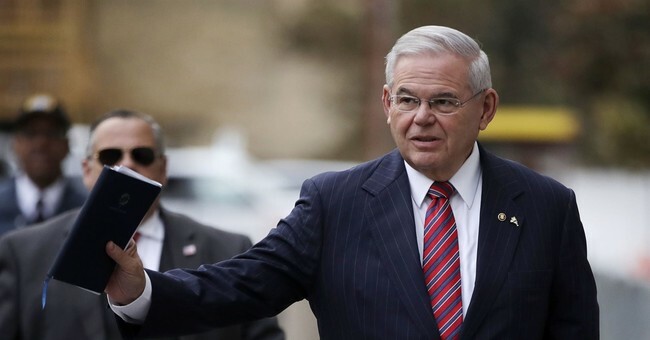 The bribery trial of Sen. Robert Menendez (D-N.J.) ended in a mistrial Thursday after jurors said they were hopelessly deadlocked on corruption charges against the lawmaker and a wealthy Florida eye doctor. A mistrial is a major victory for a senator who had to fight 18 counts of alleged corruption, and a setback for the Justice Department, whose efforts to combat public corruption have been curtailed by a recent Supreme Court decision. After receiving Thursday’s note, U.S. District Court Judge William Walls decided to interview the foreman and at least one other juror in chambers, in the presence of the lawyers on the case. “They are telling us in the clearest terms possible that they have done their job as diligent jurors. I think we have a real hung jury,’’ said Lowell. After nine weeks of testimony, the jury has struggled to reach a consensus on any of the charges against Menendez and his co-defendant, Salomon Melgen. The jury of seven women and five men began deliberating last week, and it quickly became clear there were sharp divisions. While mistrials are generally considered wins for defense lawyers and losses for prosecutors, the Justice Department will likely feel significant internal pressure to put the senator on trial again, because recent Supreme Court decisions have raised questions about how much legal authority prosecutors still have in pursuing corruption charges involving payments not explicitly and directly linked to official acts. BREAKING: Democratic Sen. Bob Menendez's bribery trial ends with mistrial after jury can't reach unanimous verdict. MISTRIAL AT MENENDEZ TRIAL, defense attorney tells reporters. Menendez emerges from judge's chambers, wraps children in a big hug. Supporters of defendants are hugging and tearing up. BREAKING: Judge Walls declares a mistrial in Menendez trial: "I find that you are unable to reach a verdict" and that "there is no alternative but to declare a mistrial." It’s possible that the government could put Menendez on trial again, but we’ll revisit that aspect at a separate juncture. For now, Mr. Menendez has clinched a legal win. We’ll see if it lasts. On the other hand, in deep-blue New Jersey, is it really unfair to ask if Menendez would have been convicted if Clinton were president or Christie was a Democratic governor? Menendez held a brief presser, where he said that the entirety of this case, how it was handled, how it was prosecuted, and how it was investigated was wrong. He also said that there were some elements within the FBI and New Jersey, who cannot stand that a Latino, could rise to become a United States Senator. He also said that he has forgiven those who have abandoned him. At the same time, he said that he wouldn’t forget those who were gunning for his seat. Of course, he had to thank the jury for using their New Jersey sense throughout the course of this trial. This guy is a character, I’ll tell you that.